The Xiaomi Redmi Note 2 was launched back in August. Now, there have been indications that the manufacturer is prepping an aluminum-clad version of the device called the Xiaomi Redmi Note 2 Pro. The Redmi Note 2 Pro will be the first Xiaomi handset to feature a fingerprint scanner. This was confirmed by images leaked last week of the phone, revealing the rear-facing fingerprint scanner located underneath the lozenge shaped dual LED flash. 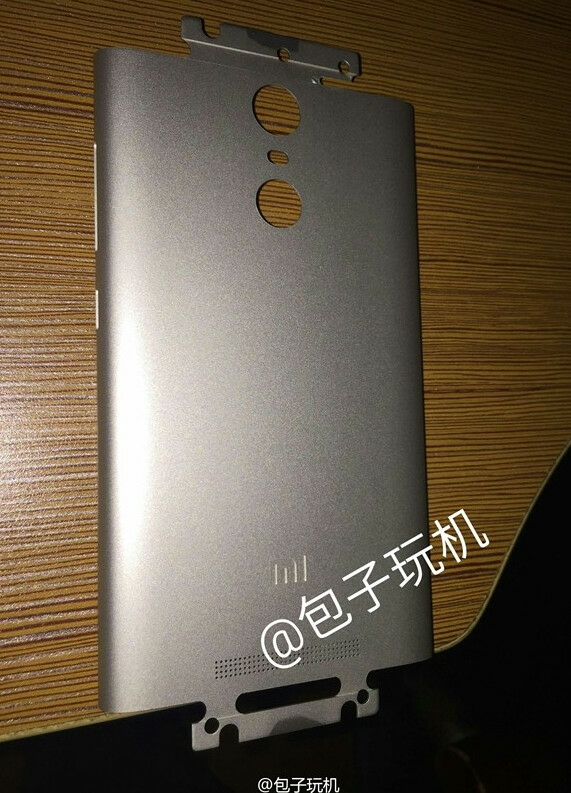 Today, another picture was leaked showing the rear panel of the phone. The latest image of the Redmi Note 2 Pro's back is an exact match for the one that we showed you the other day. Even the embossed Xiaomi logo and the speaker grille, match up in the two photos. The Xiaomi Redmi Note 2 Pro was recently 3C certified in China, which allows it to wear the CCC safety mark. Actually, all products manufactured in China, or imported into the country, must go through the process of being tested by the agency. But it does show that the unit is proceeding down the path toward its release. We should see the Redmi Note 2 Pro come with a 5.5-inch screen, carrying a 1080 x 1920 resolution. A change will be found under the hood where the Snapdragon 808 chipset replaces the MediaTek MT6795 SoC. That means that the Redmi Note 2 Pro will come with a hexa-core CPU and the Adreno 418 GPU. We expect to see two variations of the phone, one with 2GB of RAM and 16GB of native storage, rumored to be priced at the equivalent of $173 USD. The second version will feature 3GB of RAM and 32GB of internal memory, and could be priced at $236 USD. We should see a 13MP rear-facing snapper, and a front-facing 5MP selfie shooter. A 3060mAh battery will keep the generator humming. The handset will most likely be unveiled and launched in November. Red Note 2 or the Meizu Metal, that is the question. So when is aluminium , is magic and iPremium. Right? BTW Samsung make all metal the mid-price A line. And they are much more beautiful than the plastic inserts phones like the iPhones. So? I do wish they'd not call it the note unless they're going to put a stylus in. I keep getting excited then disappointed when I see a new note coming out.